Your visit in our office will begin with a comprehensive consultation and examination. At that time we will examine the area, do any needed test, and take diagnostic films. This is all done to make sure endodontic treatment is necessary. If treatment is necessary we will review your treatment options. To perform endodontic treatment painlessly, local anesthetic will be given to completely anesthetize the area of the affected tooth. If requested, Nitrous Oxide or laughing gas can also be used to reduce any anxiety. In it's simplest form, endodontic treatment is removing inflamed or infected tissue from inside the tooth. This tissue is commonly called the "Nerve" but endodontists call it the "Pulp" because it is really an aggregate of several types of tissue one being nerve tissue. Again with good local anesthesia you will be completely comfortable during this procedure. The endodontic treatment can take one or two visits depending on the clinical situation we are dealing with. Most patients return to normal daily routine after treatment. After treatment is completed you will be told if you need to see your dentist for any further work on the tooth. A final treatment report will be sent to your dentist. 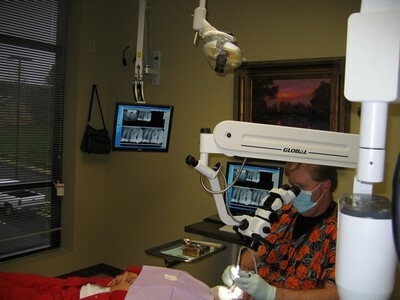 Generally, conventional endodontic therapy is all that is needed. Success rates for routine endodontic treatment by endodontists are above 90%. Occasionally, microsurgery may be needed to save a tooth. This technique can be useful in locating root fractures and treating canals that can not be accessed by standard endodontic therapy. The most common microsurgical procedure is called an apicoectomy. It is unusual for patients to experience complications after conventional endodontic treatment or microsurgery. However, if you do experience any problems, we are available to respond to you at any time. It is normal for your tooth to be sore for the first few days after endodontic treatment. Initially, soft foods are recommended, as they will provide less discomfort during chewing. The soreness may continue for up to one week. Your tooth may feel differently the second and third week. By the fourth week, it should feel like your other teeth. Prior to treatment, you may want to take an anti-inflammatory medication such as ibuprofen unless you have an allergy or adverse reaction to anti-inflammatory drugs or are taking a prescription anti-inflammatory. Dental procedures produce inflammation and a pre-op dose of 1 or 2 tablets can help. Following treatment you will be advised to take an anti-inflammatory medication such as ibuprofen unless your are already taking a prescription anti-inflammatory medication or have an allergy. Extra Strength Tylenol can be substituted for ibuprofen in those cases. In cases where the symptoms are not alleviated with just ibuprofen you may add Extra Strength Tylenol. The instructions are 2 tablets of ibuprofen, wait 2 hours and take 2 tablets of Extra Strength Tylenol. Your may alternate this sequence for up to 16 hours. If the symptoms are not alleviated by these directions please call our office. A very small percentage of patients experience post-operative swelling in the area of treatment. If this happens, please call our office to speak with the staff. For female patients, there may be an interaction between antibiotics and oral contraceptives. If you are presently taking antibiotics or are prescribed antibiotics by our office please be aware that the effectiveness of the oral contraceptive could be diminished or eliminated for that specific cycle. If you have any questions or concerns following your treatment, please do not hesitate to call our office. If you call after business hours our office has an answering service that can contact Dr. Pearson. The office number (501-221-1200) will connect you with the service.